As always we must start with a warning; if you have an antique silver item it should be handled very carefully as inappropriate cleaning can not only irrevocably damage the item but may also reduce the value. It is not widely realised that acids caused by decaying flowers, leaves and fruits can create pit marks in silver. For this reason any silver dishes used for nuts, fruit, salt etc., should be emptied, washed and dried thoroughly after every use. Chlorine and household bleach can discolour silver - it only takes the fumes! The best way to clean untarnished silver is with mild, phosphate free soap and water. Be sure to dry the items immediately to prevent tarnish developing. A soft, clean, cotton cloth should be used when drying and/ or polishing silver and you should not rub too hard but use even, straight strokes - never rub in a circular motion. Never use abrasive products and/or scouring pads or steel wool. It is best to clean silver when only lightly tarnished as if tarnish is allowed to penetrate it can permanently scar the metal. You will often find that lightly tarnished silver can be cleaned by just washing (as described above). As dishwasher detergents are somewhat abrasive, contain chemicals and the water temperature is high, silver objects should not be washed in dishwashers to avoid permanent damage. Tarnished silver can be cleaned by using the small amount of silver polish. Always use a gentle polish made specifically for silver (not a dip or multi purpose cleaner). Use a clean, dry, soft cloth to remove the polish remembering not to rub too hard and use straight strokes. You may have to repeat this in order to remove heavy tarnish. When all tarnish has been removed finish by washing in mild soap and water and then dry with a soft, clean cloth. 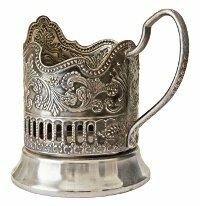 Tarnished silver can also be cleaned using the electrolytic method which is safe as it does not remove any metals it may, however, remove patina in crevices. When cleaning 'silver plated'** items it is best not to rub too hard as this can eventually remove the layer of silver, exposing the base metal. As with many things it is far easier to prevent tarnish than to remove it and, with this in mind, certain precautions can be taken when storing silver items. Never store unwrapped silver items in plastic bags of cling film. Silver should never be stored wrapped in felt, newspaper, film wrap, or chamois leather. In addition, as rubber can corrode silver even through several layers of wrapping, it is best to avoid the use of rubber bands entirely: in fact, it is a good idea to keep silver away from rubber of any sort. Items can be wrapped in acid free tissue paper or special silver cloths before placing in a polythene page e.g. Ziploc bag and sealing. Some people add silica gel and activated charcoal inside the bag. Boxes used for storage should be of archival quality, otherwise the acids may tarnish it. The term Sterling Silver indicates that the metal comprises 925 parts of silver to 75 of copper - pure silver would be too soft. **Silver plate refers to another metal which has received a thin coating of silver. We have received the following comments from site visitors. Find a container large enough to immerse the item to be cleaned. Put a piece of aluminium foil into the container and add hot water and salt*** (bi-carbonate of soda/baking soda). Dip the silverware into the solution and after a few seconds it will become white and shining. NOT RECOMMENDED FOR PRECIOUS ITEMS. ***I was looking at your tip for cleaning silverware using aluminium foil. The tip says "add the salt", which I think it misleading. It should be baking soda (sodium bicarbonate) that's being added; it should NOT be table salt (sodium chloride). In fact, sodium chloride could actually rust some metals (yes, even ones described as "stainless") - not what you want on a knife! The advantage of using the aluminium foil plus sodium bicarbonate is that the silver sulphate (i.e. the tarnish on silverware) is converted back to silver metal, which therefore stays on the silverware. So, it's not wearing the silver away! Using other methods for cleaning the silver will, over time, wear away the silver (not what you want particularly if you have silver-plated cutlery). So - use baking powder - NOT table salt! Clean silver with the juice of a lemon** and polish up with a soft clean cloth. Toothpaste is good for removing tarnish on Silver. Coat the silver with toothpaste and then with it under warm water, work it into a foam using gentle pressure. Rinse well. WARNING - toothpaste is mildly abrasive so don't rub hard. ** As can be seen above the acid in the lemon may damage silver. Be very wary when cleaning antiques or silver jewelry as this can not only damage the item but may also affect it's value.